I have only been to Hereford races a couple of times. 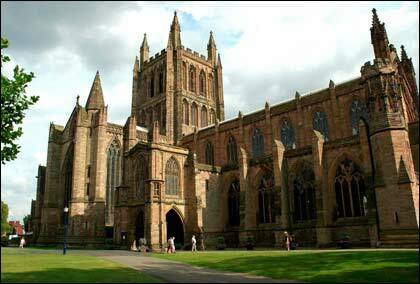 Its geography does not compare favourably with my local track – Ludlow. Although it is only 25 miles away the outlook at the track is very different. Whereas at Ludlow you have superb views of the rolling Shropshire hills from the top of the stands, at Hereford the track and surrounding area is very different. It’s very flat and all you can see on the horizon are industrial buildings. I went by train which can be a bit of a gamble on a Sunday – in fact the train I wanted to catch was cancelled so I arrived at Hereford station at 12.45 with just 15 minutes to spare before the first. I had already had a Placepot online so just needed a cab to the track, which is just under two miles from the station. There was a handful of punters at the taxi rank so I jumped in a cab with three other guys. One of the punters was very agitated as he wanted to get to the track to get on a “hot tip” he had been given. How many times have you heard that? I was determined not to ask him the name of the horse but one of the other travellers couldn’t resist. 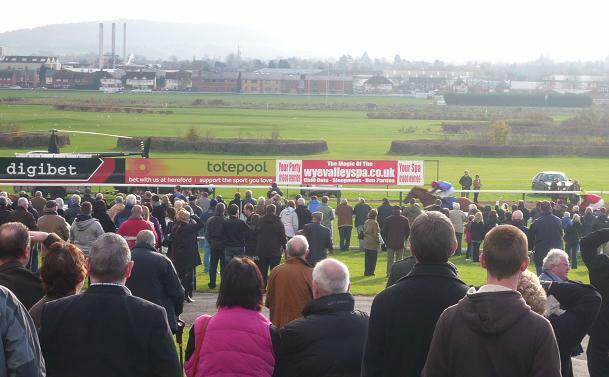 Five minutes to the off and most punters were faced with the £18 entrance fee. Thanks to Tesco Club Card I had a voucher for entry, which cost just £5 in Club Card tokens. These vouchers are available for all Northern Racing tracks. It was a bright sunny day and despite the cold the attendance looked good. I don’t know how things will pan out for this track in the long term though; the company will do well to keep it open once the full implications of the Levy are known. I was concerned now as I’d bankered Nicholls’ Forlovenormoney in my Placepot and I noticed it was drifting like a barge close to the off. Needless to say it was tailed off and my Placepot was down by ten-past-one. 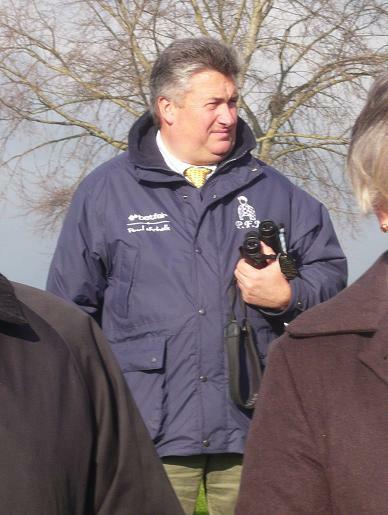 Paul Nicholls gives up tracking his runner in the first! The day was “themed” with various beers and Balti available. I restricted myself to a half-pint of the excellent Butty Bach from the local Wye Valley brewery and swerved the instant gratification of the curry. Having backed a loser in the second I played the Quadpot, which in theory would cover the next four races. This is the bet designed for punters whose Placepot goes down in the first two races. Once I’d sorted that out I watched the wife-carrying race. It’s a shame my wife was not with me so we could have taken part! Although having seen the field it all seemed a bit professional. One couple in particular – who had travelled from London for the event - looked very useful in the warm up. She appeared to be some sort of contortionist as her head disappeared through her legs past her ankles and out the other side. A bit over the top you might think – after all she wouldn’t be doing anything other than being carried! They won in a canter. The Quadpot went OK in that I had multiple placed horses in two of the four races. The trouble was I think everyone else did too. I waited with anticipation to hear the dividend: £8.80. I had it four times but my total stake had been slightly more than my total return! The light was starting to fade and I had to decide whether to commence the walk into town or stay for the seventh. This was a 15-runner conditional jockeys’ handicap hurdle with a short-priced favourite called Just The Job. I thought maybe I could take this one on with a couple of tote win bets. I had small bets on Himitas and Nouaihas and a bigger bet on Ruby Valentine. The first two were big prices but Ruby was second favourite in the ring yet showing 10+ on the tote. About four out all three were in contention and it looked very promising. As they approached the second last Ruby took it up going quite well only to be joined by the favourite coming to the last. The jock on the fav was looking around for non-existent dangers in third place as the fav cruised hard held. Surely it was only a matter of time before he sprinted clear? Then the fav made a slight mistake at the last, lost his momentum briefly, and my selection managed to get first run to the line. Ruby Valentine was returned 13/2 second favourite and I waited patiently for my 10+ tote dividend. I couldn’t believe it when they announced £6.40! What a nightmare. As I picked up my winnings the tote cashier lent forward and pointed at my head: “Sir, you have a spider in your hair”, she said. That certainly had not brought me good luck with the dividend but I guess I was lucky to be on at all. I would not have played if I’d seen £6.40 projected before the off. I left the track and started the 15-minute walk into town. Hereford centre was not very inspiring. The pedestrianised shopping centre was dark, cold and empty, save for a couple of people walking dogs. The area around the cathedral is more attractive. I was very hungry. There aren’t many good restaurants in Hereford so I was happy to find myself in Pizza Express. I ordered one of the biggest pizzas on offer and a large glass of wine. My winnings at the track just about covered my drink. The food however was “free”. Thanks to Tesco Club Card.